Folks who follow Marvel news better than I do already knew that Conan the Barbarian would be crossing over into the prime Marvel universe quite a while ago. I found out last week when it happened right before my eyes in NRH #5. Now it's underway with a vengeance, and No Road Home #6 has completely converted me from a doubter to a believer. The fast takeaway is that the creators have sneakily inserted a Conan comic (a really good Conan comic) into their Avengers event. But that's not the whole story. This is also a good Avengers comic. It's even a pretty dang good Scarlet Witch comic. Most of all, this is a revelation of the fact that the No Road Home was designed, at least in part, as an exquisitely clever vehicle to merge Conan into the main Marvel universe. This issue smoothly draws the sutures tight and makes the graft look like the most natural thing in the world. Goddess of the Night wreaking havoc on mortals? A hunt for magic crystals to stop her? Scary demigods barring the heroes' path? What is there about this situation that doesn't sound like a job for Conan?! The extra buck on the price tag this week buys an extra 8 pages of the Hyborian Age, and it's an excellent deal. 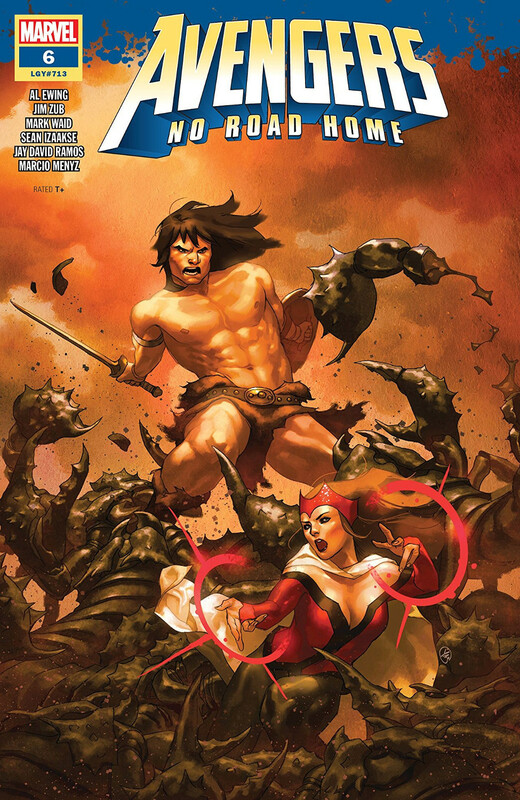 Conan swings into capable action, promising his help to the Scarlet Witch and putting both his sword-arm and his wits to work. Their story is long enough to take enlightening looks at both characters from many different perspectives. There are conflict and teamwork, alienation and identification, hatred and love … it's quite a powerful relationship that builds up. Their journey is also visually impressive. Settings and actions are varied enough to show off a broad range of looks and locales. Of course, there is plenty of sharp-eyed teeth-clenched fighting for Conan to do - against gorgeously ugly opponents - but the art also shows him off in thoughtful, shrewd, even vulnerable moments. The palette takes impressive steps to separate Conan's world from the prime Marvel universe. Colours are slightly less intense but still drawn from every segment of the rainbow, bringing the Hyborian Age to throbbing, passionate life. And then there is the issue's one key cutaway to the Avengers' story. It's speedily rendered from an artistic standpoint, but the plot developments are incredible. And - hopefully, it's not a spoiler in itself to say this - the colour work for that scene is tremendously important and tremendously successful. The length and Conan-centric nature of this issue technically count as potential drawbacks. I'm sure there are people who don't want to spend this much time (and money!) with the Cimmerian. All I can say is that the creators have truly gone above and beyond to make the Barbarian's interlude as compelling and inviting as possible. And I think the tones make a remarkable match: No Road Home has already developed into a very mythic story, and Conan slides into it as seamlessly as an perfectly-cut jigsaw piece. No Road Home #6 devotes itself almost entirely to the event's surprise guest star, Conan the Barbarian. While it unfolds into a good Conan yarn in itself, the links to the larger event are surprisingly thorough and impressively clever. If you're already following the event, this is going to do a great job of turning you into an enthusiastic supporter of Conan's imminent arrival in the main Marvel universe. Out of this issue's spillion Conan achievements, the most impressive might be making Crom - of all things! - a strongly applicable part of No Road Home.